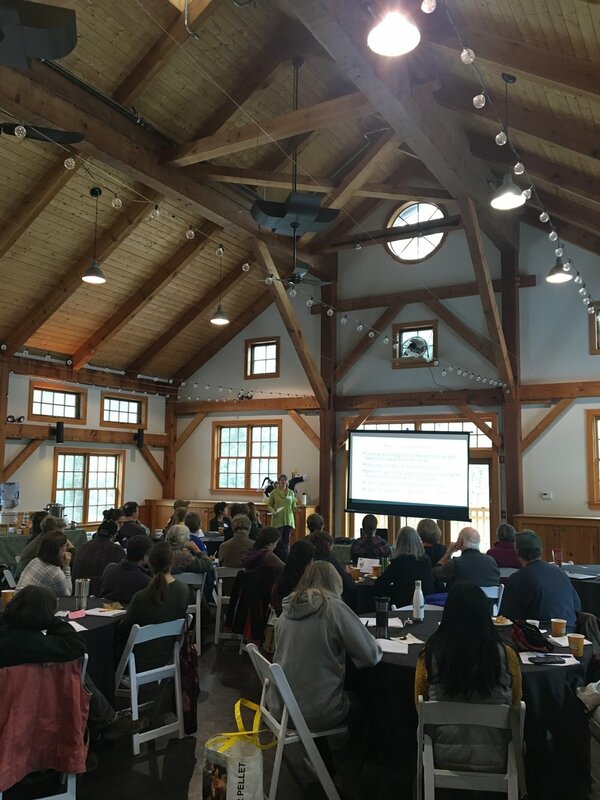 Over 80 Monadnock farmers and stakeholders attended the "Farm Marketing Workshops" forum last month at Stonewall Farm. Thanks to a grant from NHCF, MFCC brought marketing experts from our region to share their experience, lessons learned, and tools & resources to local farmers looking to broaden and strengthen farm profile and sales. Cabot Creamery's NE Marketing manager & member integrator, Chris Pierson and Rose Gomez, peppered audience with ideas of how to cross-pollinate market - identify partners and collaborate; develop "your unique farm story" and translate into logos and branding for website, clothing, fostering name/brand recognition; and how to strengthen online presence & integration through social media and picture-sharing. Nancy LaRowe of Valley Food & Farm, Vital Communities in White River Jct., VT, focused on the 4 P's of marketing with a focus on on-farm events - Product, Price, Placement and Promotion. Product - Is your staff friendly and identifiable? Do you have time and interest to talk with customers? Price - Know your market and know your costs! Is your pricing competitive with marketplace for your product? Does it generate sales consistently? Is the price acceptable to your customer base? Placement - Is your farm easy to find? Have you clearly designated and roped off hazardous areas for the public? Have you consulted with your insurance agent about farm visitors & liability issues? Promote - Identify your desired market and build a promotion plan! Have you established brand recognition? Presence in your community? Do you use social media? Have a great website? Nancy's powerpoint can be found here. Monadnock Buy Local's director, Jen Risley, is a nationally recognized marketer of "all things local." In "Social Media: Best Practices" workshop, Jen challenged audience members to sign up and use all modes of social media including: website, Facebook Business Page, Instagram and Twitter. First up: identify top goals for your farm this year. Depending on response, cross-pollinate and leverage with national/local events - i.e. if increasing CSA sales is a goal, partner with national marketing initiatives by using hashtags (National CSA Day 2018); offer taste tests at local Coop on CSA day, etc. Jen illustrated best uses of text, images, hashtags posts, and blogs to improve and expand audiences. Share everything! And collaborate with others using social media - join Facebook groups like Monadnock Region Local Food & Products or Monadnock Farmers & Producers. Thank you to Stonewall Farm for the use of the community room and the Monadnock Food Coop for preparing a delicious lunch.